If your debts are so bad that you are going to have to choose one of the three types of insolvency, you know this will wreck your credit rating, but how long will this continue? This article answers this and other you may have about the effect of insolvency on your credit record such as Will you ever be able to get credit again? What about a mortgage? Is bankruptcy worse than an IVA or a DRO for your credit score? 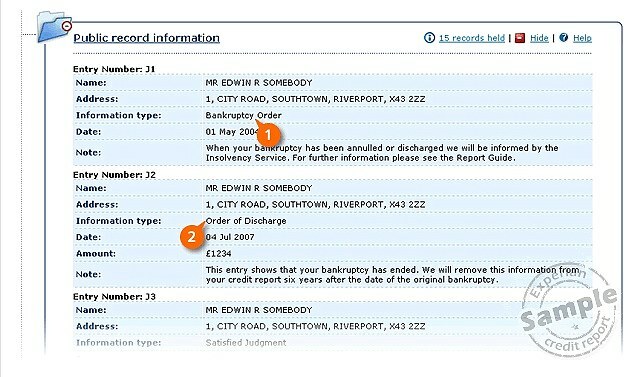 All three forms of insolvency are shown on your credit records in a similar way. Initially the start date of the bankruptcy, DRO or IVA is shown in the Public Record section. Later another record showing your discharge from bankruptcy, completion of the DRO or completion of the IVA is added. If you are given a Bankruptcy Restriction Order (which are rare) this is also shown. Here is an example from Experian that shows bankruptcy and discharge from bankruptcy. After six years it all disappears… or does it? After six years from the start date, if your insolvency has ended, both the start and the completion records will be deleted from your credit file and a future lender will not be able to tell you have been insolvent. Your debts should have been marked as defaulted on or before the start on your insolvency – these will disappear six years after the default date, so by the time your insolvency marker goes, the debts will also drop off. So there will be no trace of your insolvency left after six years, with four exceptions. lenders can keep their own records for as long as they want. So if a debt to NatWest was included in your IVA or bankruptcy and you later apply to them for a loan you may still be turned down even if your credit record looks “clean”. One situation you may think is an exception isn’t. If you settle your IVA early, even if you repay all your creditors in full, the IVA marker will remain on your credit records for the full six years and during this time you will be unable to get a mortgage. clean up your credit record after an IVA. Those articles also covers applying for a “bad credit” credit card to start getting some good repayment markers on your credit file. If you don’t take out any credit until after the six years ends, you are likely to have a very “thin” credit file, as all the old debts will have gone leaving nothing, which doesn’t look good to a future lender. Because bankruptcy and DROs end after a year, in practice this means you can start the credit repair process sooner than with an IVA. This isn’t a huge factor though – until the six years is up, your credit score is never going to get to be good. What about a future mortgage? There is a common myth that if you go bankrupt you can never get a mortgage… and it is also frequently assumed that an IVA is “better” than bankruptcy for getting a mortgage in the future. But as the above examples show, you are likely to have some problems getting a mortgage after any form of insolvency. In this situation, you should always go through a mortgage broker, not direct to a mortgage lender even if you are applying several years later and your credit file is back to looking good. she will make payments in bankruptcy for 3 years. So is one sort of insolvency better or worse for credit ratings? Not really. The shorter duration of bankruptcy and DROs means that you can start the “credit file repair” process a bit sooner than with an IVA, but it will still take six years until your score can really improve. For mortgages you are likely to have to disclose any type of insolvency. I suggest that worries about credit ratings and dreams about buying a house in future should come low down on your list of factors when trying to choose how to tackle your debts. Instead look at the practicalities – how much will you have to pay for how long, what flexibility is there, do you have equity that you need to protect etc. Debt Camel’s Hard Debt Choices page gives direct comparisons of the different debt options. Do you qualify for a Debt Relief Order? I cannot afford the £705 for Bankruptcy; I have no job and no income to opt for an IVA. I do not qualify for a DRO as my debts are over £35k. I have no assets, no property, no car. What would happen if I simply did nothing ? Would it be viable for my creditors to petition for Bankruptcy ? (What would be in it for them). What other options are available to me ? My partner has a dro that is 31 months old. He has recently got a credit card to start building up his credit profile. My credit score is good (934) his (437) we have a 25,000 deposit for a mortgage and the house is 80,000. Our joint income is 39,000 and have one dependant and have around £2000 in debts which we pay on time. Will we be declined because of the old dro my partner has? Hi Jemma, the DRO will make it harder, but you have such a good deposit and Loan to Income ratio that you may be ok. Talk to a mortgage broker. If broker says “no”, then you will need to talk to a “bad credit” specialist broker. Hi, Just looking for some guidance. I went bankrupt in January 2010. The bankruptcy has now been removed from my credit reports. I still have 2 default accounts showing on 2 of my CR’s but I have written to the credit card company and have asked for the defaults to be removed as they were included in the bankruptcy. I have an overdraft with my bank which I am reducing each month and hopefully can clear over next month or two. I also have £5k balance on my credit cards. I earn £29k and hope to apply for a mortgage of £90-£100 with a £10k deposit at the end of this year. By that point I wont have an overdraft and I should have reduced my CC balances by at least half. What are my chances of being accepted? Also once I clear my overdraft should I have the option to have it taken off and same with Credit cards – should I close those accts if I pay them off in full or keep them to show available credit to me? Thanks, this is a really good site. Getting the defaults removed from your credit file is essential. The lower you can get your credit card balances the better. Whether to close is a difficult question, see https://debtcamel.co.uk/close-unused-credit-cards/. If you have say three cards, my inclination would be to clear and close two of them and keep the third open even if it is actually clear. I am always reluctant to speculate about people’s chance of getting a mortgage in a year’s time. So much can change in the mortgage market! With a 10% deposit, it shouldn’t bee impossible, but talk to a broker as you don’t want to make applications to one of the lenders that will always reject you because of your bankruptcy. If the broker doesn’t seem optimistic, your choices are to wait another year (and hopefully save a larger deposit) or to go to a specialist bad credit broker. A bad credit broker would almost certainly be able to find you a mortgage but it would cost more in fees and may mean a higher mortgage rate. i had a DRO in september 2013, i was discarged in september 2014 (completed DRO). i recently checked my credit history/score and one of the debts which was included in the dro is showing as account open and defult payment marked every month since september 2013.
can they do that? or should they mark it as closed account, satisfied or something other than default? im facing another 4 years of default payments on my history. The debts included in your bankruptcy should be marked by the creditors “to show that you no longer owe money on that account (perhaps by marking the entry as ‘partially satisfied’ or ‘partially settled’ or in some other way)” (quote from the Information Commissioner’s Office). is this correct? can i aproach the company in question and ask them to change it? Yes that is right, all your DRO debts should now be marked as closed with zero owing. Use the letters here https://debtcamel.co.uk/repair-credit-record-dro/ to complain! The IVA will be on your credit record for another 4 and a half years. If you want a re-mortgage during this time, you will not get a top deal from a high street lender… your options are to go to a bad credit broker or to stick with your lender’s Standard Variable Rate. I had a DRO that started in April 2013, and discharged April 2014. Should the defaults have stopped on the accounts on or up until April 2013, as some have continued to April 2014, which was the end of my DRO. Is this correct? and will they fall off from the date of the first default or the last one?? Hi Claire, the first default on each debt should be on or before April 2013. After that it is fine for the defaults to continue until April 2014, when each debt should have been marked as closed with a 0 balance showing. Each debt will disappear 6 years after the first default date. My girlfriend and I are looking to buy our first home and need to start the process of applying for a mortgage. We are looking at houses in the region of 250k and have at least a 50k deposit, combined salary over 50kpa. My credit history is clean, however my girlfriend had a DRO in Jan 2010, this has removed all but one default accounts from her report. The remaining default account has a default date of 19/03/2010 therefore we are hoping this will come off in less than two weeks (no point in writing to them as date is so close). Do you think it is worth waiting until after the 19th to apply for a mortgage, and even though her report will technically then be clean, will this effect our chances of getting top rate deals? If the DRO and all effected accounts have come off the report, do we have to still declare to a lender that she has been ‘bankrupt’ in the past or is it now irrelevant and we can say no? You have to answer honestly any questions that you are asked. So if the form asks if either of you has had a DRO or been insolvent at any time you have to say yes. There are firms that will still reject any application because of this, but with a 20% deposit you should be able to get a mortgage. Go through a broker though, not direct to a lender. I have been divorced and unable to get his name off the mortgage despite him signing a transfer deed 7 years ago. I was unable to make the mortgage payments and eventually resorted to an IVA as I was afraid of losing house and it has finished 2 yrs now. I am still unable to get a better mortgage deal or a new mortgage and am now desperate. Repossessed houses in my estate have recently sold for £45,000 and after 10 yrs paying a mortgage of £660 before rates and insurance I still owe £102,000 and don’t know where to turn. I have since remarried but want to know want the consquences are for both of us. I am sorry but it sounds as though your IVA was a disastrous idea – it would have been better to have gone bankrupt, had the house repossessed and rented… by now your credit rating would be back to good and you could think about buying again. I think you need debt advice on your full situation and I think this should done jointly with your husband. Although the mortgage debt isn’t his, what your options are now as a fmaily will depend on seeing the complete picture. I suggest you phone National Debtline 0808 808 4000 or go to your local Citizens Advice if you would prefer face-to-face advice. Hi, i am currently cleaning up my credit file as i was declared bankrupt in 2011 and released from this in 2012. i found i had defaults with amounts next to them which should have been included in the bankruptcy, these have now been cleared but one of the defaults is for a partial settlement of a second mortgage/secured loan on a house i owned. this is the last default and due to drop off my credit file in October this year, would i be able to get a mortgage or would i have to wait until this has disappeared altogether? we are looking at borrowing £140,000 and we have a deposit of a £160,000 my wages are £36,000 a year and my partners is £12,000? The remaining default won’t make so much difference because the bankruptcy market will still be on there until 2017. Until that point it’s going to be very hard to get a high street mortgage. You could go to a bad credit broker, they are pretty expensive but I would be surprised if they can’t get you a mortgage now as your deposit is so large. After the bankruptcy marker goes you will have a wider choice of lenders so it should be cheaper. Hi, I have debts of £20k that I have been paying off in a long DMP that I arranged direct with my creditors. All my debts have default dates around the 3 year mark, so expect to see them clear in 3 years. However, with the amount that I am paying on the DMP, my debts will still outstanding beyond this date. If I carry on as I am, will my creditors post NEW default dates after the 3 years? I am considering DRO, but I really don’t want ANOTHER 3 years of bad credit after the defaults have cleared. I was declared bankrupt on the 7.4.2011. Discharged after 12 months. In April 2017 I will be applying for a morgage with a 20% deposit.what will my chances be. I also have had 2 credit cards for the last year which i pay off in full each month, will this help my credit score and how much will my credit score increase by after my 6 years are up. I assume you have “cleaned up” your credit record so there are no debts left with default dates after you went bankrupt. The two credit cards you are repaying in full every month should mean you end up with a very good score after bankruptcy disappears next April. When you apply for a mortgage, go through a broker not direct to a bank – the broker should know which banks will be prepared to offer you a mortgage – with a 20% deposit you should be OK with the right bank! How can i check my credit record has been cleaned up. When i go on to noodle to check my credit score it states i have a bankruptcy but states i have been discharged and no ccjs. I really appreciate this blog! I think that finance should be a subject taught in schools from young age. I have gone to an IVA last year, after annual review my payments have gone up by £250 which is a lot (originally was £80) I decided to go for an IVA because my husband lost his job and we were desperate to get some comforting news about our debts (£10K in total). I will be graduating soon and really hope to increase my income (at least triple it) and my husband is on training and will double his income soon, which would mean that my IVA payments would be huge! IVA really didn’t work for us as we were unable to work extra hours or save some money… So we asked for termination and decided to pay our debts (creditors agreed). Can you please advise me if it’s worth to pay off the debts asap or take it slowly (there is no interest on the accounts, they are closed so is all what’s left, creditors happy if we pay whatever suits us) and save a bigger amount so that in 5 yrs time we can ask for mortgage (with a bigger deposit). If we pay it quicker (2 years) what are the chances of obtaining a mortgage with just 10% deposit before the default is deleted? An interesting question! I guess your IVA still showing on your credit record? I didn’t completed it, I left after 1 year… The IVA people and my creditors said it will show for another 5 years but if I pay the debts the status on the account will change to ‘satisfied’ so do you think this could improve our credit score? (enough to be accepted for mortgage). I think the chance of you getting a mortgage during the remaining years the IVA is showing is very low. And if you did it would be at a very bad rate. I think you need to plan for having repaid your debts and having as large a deposit as possible by the point the IVA marker disappears. I do suggest repaying the debts as fast as possible because although your creditors may be happy now, they could always sell the debt on to a debt collector. The faster you repay the debts, the less likely this is to happen. Also make sure all the debts have default dates on or before your IVA started, then you will have a clean file at the end. Thank you Sara for your help! After reading your other articles and comments I realised I should have never gone for an IVA. Thank you for your advise, much appreciated! Hi, I have a debt of close to £50K across wide range of creditors including Banks, Big CC companies, supplemental companies like (wage day, pay day, etc). Recently i lost my JOb and am NOT in a position to pay minimums and was defaulted by a few creditors as well (lack of min. payments). I have requested money from parents and they agreed to support with some. I don’t think I have CCJ’s. I read this article and peoples’ comments. Very useful. But I do have some basic questions ..
1. Which option is better? IVA or F&F? Why (Current and Future)? – there is no way your creditors would accept a low F&F, it is too soon. Perhaps after 3 years! I have therefore deleted your long list of questions about IVA and F&Fs as they can’t be relevant for you at the moment or in the next few months. Your only possible full debt solution at the moment would be bankruptcy which seems a bit of an over-reaction to being without a job for 3 months. I suggest you postpone finding a final solution to your debts until you are in work. In the mean while, contact all your creditors and offer them a token £1 a month, see https://debtcamel.co.uk/token-payment-debt/. And look at whether you can reclaim any PPI or interest on payday loans. Either of these will reduce the amount of debts you have. That is a great deposit and it’s beyond the 6 year point for your partner so I hope you won’t have problems. Also I suggest talking to a mortgage broker not applying direct to a high street bank. There will be lenders happy to give you a mortgage, but it would be bad luck if you pick one that will refuse you because of this old DRO. After 6 years debt free after a DRO what if say for example you find out an ex partner had been taking out credit fraudulently in your name, but the Police and any companies insist as they are in my name, then I am liable , not him? Would I be allowed to take out a 2nd DRO please? I have no means to pay off his debts. I even applied to go on Judge Rinder , but I couldn’t as I didn’t know my ex’s whereabouts ? You can’t get a DRO if you have applied for one in the last 6 years – but it sounds as though you are now past this. However I think you should first take some advice on whether anything else can be done to challenge these debts – go to your local Citizens Advice and ask about this. If the answer is no, then they will be able to help with a DRO. I have been hunting all over for some decent and recent reference info. Your site and answers are really great. Unfortunately I was made redundant 4 times in a row 2009 -2011. Totally wiped my finances and savings out. I had around 7 defaults and made a voluntary agreement to pay it all back under Scottish DAS. Thankfully 5 years on in 2016 I was debt free again. Trouble is, I have the defaults from 2011 (due to “drop off” Sept 2017. I also have the DAS showing under IVA, also due to drop off Sept 17. Long and short I want to buy a house. I have a good deposit around the 40%. I have used a credit builder cash card and just taken out my first credit card in years ( a sub prime £1500 limit) but it was a 60 second auto accept full top available limit. This gives me a little confidence dispite having a Very poor credit score. I’m looking to understand the actual meaning of a default “falling off”. As the accounts show miss payments, even with the default off they may still badly impact my history. Will the account totally be removed or just the defaults. Will I need to wait another 4 years for them all to be old enough not to show up? I have not missed a payment in 5 years but some accounts that were defaulted continue to show 6/8 late payments consistent. balances all now zero as of may 2016. But up till that point and after default continued to register the late payment. But 100% show a 2011 default date. All new accounts following my DAS and my mobile phone account have never missed a payment. I did note your info on mortgage applications to same bank as default. Thankfully my current bank wasn’t affected and now been with them for 6 years. If a debt has a default date on it, the whole debt will disappear from your credit file 6 years after the default date. It’s not just the default marker that is deleted, it is the debt itself. So your record is going to be completely clean later this year. Hi I have around £60k worth of debt, £32k which was loans from HSBC which have now been passed to collection agency who have’nt been in contact for quite some time regarding this. I aslo owe HMRC £30k in self assessment tax. I would like to try get a mortgage at some point and realise going bankrupt or an iva would hamper this. Would u recomend setting up a payment plan if this is affordable, or going down the bankruptcy route and waiting. That rather depends on how long it will take to repay the debts. Assuming you have spare income to make payments, you would have to make payments in bankruptcy for 3 years. An IVA may be impossible anyway as HMRC are often a difficult creditor and you owe them so much that they could veto an IVA. I assume you are self-employed to have got that much tax debt – I suggest you talk to Business Debtline, contact details here: https://debtcamel.co.uk/more-information/where-to-get-help/. I entered an IVA on 28th September 2011 & it’s due to complete 28th Sept 2017 (had to do an extra year as couldn’t release equity in my home). I was single when I started the IVA & am now married. My house is rented out at the moment (as I live elsewhere with my now husband in a private rental). I will once IVA completed on 28th Sept 2017 put my house on the market so I’ve got a clean slate. Next year (Sept 2018) I’ll be looking to buy again with my husband. We will have at least a £50k deposit by the time we’re ready to buy again. My husband is squeaky clean financially & his credit rating is 999. He earns approx £55k PAYE & I earn £20k PAYE. He refuses point blank to go down the “sub prime” lender route. Will my IVA (although completed in Sept 2017) still show on my credit file as “satisfied/completed” or will there be no trace at all, which means I don’t have to mention it to any lender. I’m terrified that I’ll be the fly in the ointment, forever stopping us from taking out a joint mortgage with a high street lender. We wouldn’t ever take out a mortgage with a “sub prime” lender (husband refuses to pay the higher interest rates). I feel truly punished for my mistakes & have paid a hefty price for the last 6yrs. I don’t want to constantly declare the completed IVA & be penalised forever for it. Your IVA will have disappeared from your credit record before you apply in September 2017. BUT you must make sure you don’t apply to any mortgage lender where you had a debt to that bank included in your IVA, as they may still be able to see that on your records. You must also answer any question on your mortgage application honestly – if you are asked if you have ever been insolvent or had an IVA, the answer is yes. But you should still be able to get a mortgage from a high street lender at an OK rate. Don’t apply direct, go through a broker and make sure the broker knows about your IVA. Yes. And it will be on your credit record for 6 years anyway. My bankruptcy start on 10th January this year. After 10th January 2018 will I get notifyed or anything when I am not bankrupt anymore? I have been advised by CAB to file for bankruptcy for debts in excess of £25k accumulated over the past 5 years while a university student thus not working (none of this debt is student loan). Part of this debt is a £12k credit card however the reason I was allowed such a high credit limit while not even in employment is by lying about my employment status and exaggerating my annual income. I have informed CAB of this but they were vague and unsure of the implications this may have on my bankruptcy a) being accepted, and b) if this might render me liable for a criminal charge for committing fraud? Having read up on the insolvency conditions etc I can see that I may have restrictions added to by bankruptcy which may last longer than the usual 6 years. I can manage this however can you please advise the likelihood of my being charged with fraud or any other criminal offence? I would not file if I thought that this was a risk for fear of it impacting on my employment given the line of work I do. There really aren’t any clear rules here and no one is going to tell you what the chance is of your getting a BRO. The chance of a prosecution for fraud is a lot less. One option is for you to struggle on for another 6 months or a year before going bankrupt – the further in the past your problems are, the less they matter. Thank you, the info via the link and your advice have been very useful. In your opinion would this be considered long enough to have struggled with this debt? It was never my intention to take so much then bankrupt, I did not even know this was an option until suggested by CAB. There were also specific change in circumstances that lead to my defaulting on repayments. “I have had this particular credit card debt ($12k) for over 14 months, and around £7” not sure how that sentence was supposed to end? What were the change in circumstances? Is a DRO a bankrupcy? If over 6.5 years has passed and it’s off the credit file, is the answer to the question a yes or a no? I thought once cleared you do have to declare it. I think the answer to that is No …. but I always suggest going to a broker and telling the broker about the DRO – take their advice. I had an IVA that was revoked after one month, therefore it was never used to clear any of my debts, is there any way of removing this from my credit history? I have this and a ccj which was submitted in Dec 2014, this was from a loan that I took out in circa 2007, is there anyway of removing this. I have no other advertises on my credit score, I even had credit cards now to boost my score, however I cannot even pass a tenant referencing check?? No I am afraid the IVA will remain on your credit record for 6 years, there is no way to get this deleted. There is also the potential problem that you may still get other CCJs for the debts in your IVA unless these have been settled. Thanks Sara, these debts are no longer on my credit report as they are now over 6 years old. I appreciate the advice. You may still lose a CCJ, which would then be on your credit record for another 6 years. I came out of bankruptcy in January however on my credit file the some of the debt which was included in my bankruptcy still hasnt ‘settled’ it looks like it is still running. Should this be the case or should I call them? No that doesn’t sound right. See https://debtcamel.co.uk/credit-file-after-bankruptcy/. Hi there I am looking for a bit of advice. I am in a bad situation with debt and I am trying to decide between a DRO or a DMP a debt management plan would take about 10 years to pay off. I am wanting a mortgage in the future (I am 25 just now) and was wondering what option is best. Also how does renting work when on a dro. Have you talked to a debt adviser who says you meet the DRO criteria? How large are your current debts? Do you expect your finances to improve over the next few years?